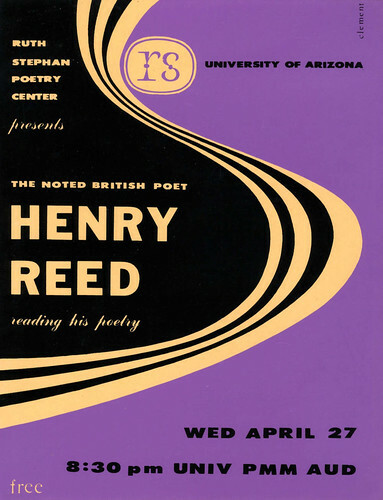 The University of Arizona Poetry Center has a terrific exhibition of vintage posters for poetry readings sponsored in the 1960s and 70s, for such acclaimed poets as Marvin Bell, Elizabeth Bishop, Louise Bogan, John Ciardi, C. Day-Lewis, W.S. Merwin, Delmore Schwartz, Karl Shapiro, and James Tate. The silkscreen posters were created by art students at the university, the results of a competition vying for the best design, and they are wonderfully inventive and vibrant. The "PMM AUD" mentioned in the poster was the auditorium in the old Physics, Mathematics, and Meteorology building at the university. I e-mailed the Poetry Center with a question about the date of the reading, and to my dismay they informed me that Reed cancelled at the last minute. Typical Henry. There are hints that he had to take on Elizabeth Bishop's classes in Seattle when she came down with the flu, and his drinking habit was getting the better of him. You can also view the University of Arizona's vintage Poetry Center posters (and many, many more goodies!) in the Arizona State Library's online repository, the Arizona Memory Project.